Pippy’s Cafe is open for business. Photo by Wendi Dunlap/Beacon Hill Blog. There’s a new place to eat on Beacon Avenue, where Pippy’s Cafe opened this week just south of the corner of Beacon Avenue South and South Stevens Street. The café’s menu features salads and sandwiches, including chicken or tofu pita sandwiches, veggie wraps, a chicken club, and more. Soup will be added to the “Simple Foods Made Fresh” menu soon. 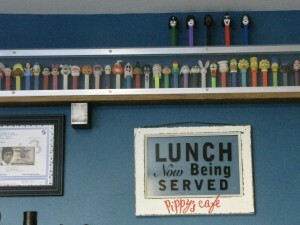 Pippy’s is open Tuesday-Saturday from 11 a.m. to 7 p.m. at 3007 Beacon Ave. S.
This Pez collection may be seen behind the counter at Pippy’s. Photo by Wendi Dunlap/Beacon Hill Blog. I can’t keep from bragging about this new Cafe and business although I haven’t been there yet. I am more for the 4pm to 7 pm dinner bunch. Someone suggested that perhaps they could lengthen that time to 9 pm, once they get settled and their expectations of customers reviewed. 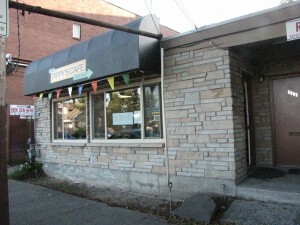 It is no small feat to open a small Cafe, but maybe it will be a miniature copy of Geraldine’s in Columbia City. Pippy’s will match the other good ethnic restaurants on No. Beacon Hill. Pippys cafe now offers brunch on Saturdays!